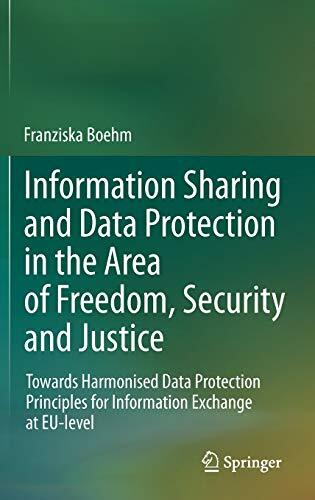 [PDF] Information Sharing and Data Protection in the Area of Freedom, Security and Justice: Towards Harmonised Data Protection Principles for Information Exchange at EU-level | Free eBooks Download - EBOOKEE! Description: Privacy and data protection in police work and law enforcement cooperation has always been a challenging issue. Current developments in EU internal security policy, such as increased information sharing (which includes the exchange of personal data between European law enforcement agencies and judicial actors in the area of freedom, security and justice (Europol, Eurojust, Frontex and OLAF)) and the access of EU agencies, in particular Europol and Eurojust, to data stored in European information systems such as the SIS (II), VIS, CIS or Eurodac raise interesting questions regarding the balance between the rights of individuals and security interests. No comments for "[PDF] Information Sharing and Data Protection in the Area of Freedom, Security and Justice: Towards Harmonised Data Protection Principles for Information Exchange at EU-level".